Shabaab, al Qaeda’s branch in Somalia, overran an AMISOM (African Union Mission in Somalia) base in the town of El Adde. At sunrise, two vehicle-borne improvised explosive devices (VBIEDs) cleared the way for hundreds of jihadists to stream into the base. Not all of the Kenyan soldiers were killed. At least 11 of them, according to the UN, "were captured alive and subsequently held hostage in two separate groups by” Shabaab in the Middle Juba region of southern Somalia. 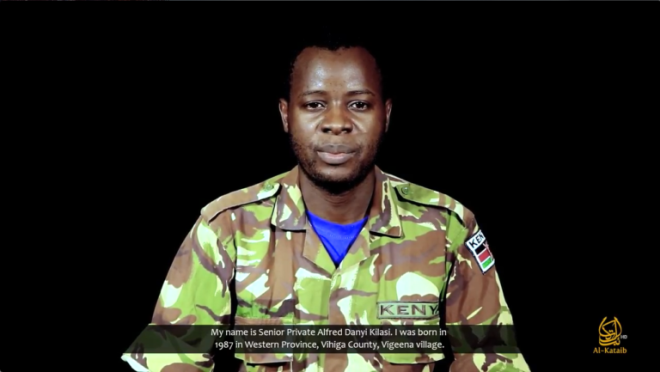 One of those Kenyan soldiers, Alfred Danyi Kilasi (seen obove), appeared in a Shabaab video released online earlier today – more than 16 months after he was taken captive. The video, along with an English transcript, was produced by Al-Kataib Foundation for Media, Shabaab’s propaganda arm. Shabaab has Kilasi criticize his own government and plead with the Kenyan people to intercede on his behalf. Kilasi’s tragic appearance is the latest instance in which Shabaab has used the Jan. 2016 attack, and the aftermath, in its propaganda. Shabaab said the raid was carried out by its Saleh Ali Nabhan Brigade, named after a notorious al Qaeda leader who was killed in 2009. Nabhan had been wanted for his role in the 1998 US Embassy bombings, as well as a series of plots in Mombasa, Kenya in 2002. The brigade has been responsible for some of Shabaab’s highest profile operations, including the July 2010 bombings in Kampala, Uganda. Then, in Apr. 2016, Shabaab released a 48-minute video promoting the massacre as "The Sheikh Abu Yahya al Libi Raid.” Al Libi was a senior al Qaeda manager and popular ideologue when he was killed in a June 2012 drone strike in northern Pakistan. The Kenyan government was accused throughout the international press of covering up the extent of its embarrassing defeat in El Adde. The UN found that Shabaab’s Apr. 2016 video "depicted a highly uncoordinated and tactically unsound assault on the part of” Shabaab, but the "Kenyan forces also failed to implement basic defensive measures, such as constructing fortified barriers at the entrance to the camp and neglecting to man machine gun and mortar emplacements.” Other intelligence failures were cited as well. Even if Shabaab isn’t seeking an exchange, the group is all too happy to promote what the UN has described as the worst defeat for the Kenyan military in its history.